AI and robots seem to be everywhere, handling more and more work, freeing humans up -- to do what? Contributor Jill Eisen takes a wide-angle lens to the digital revolution happening in our working lives. What will happen when robots and algorithms surpass what our brains can do? Some say digital sweatshops -- repetitive, dull, poorly paid and insecure jobs -- are our destiny. Others believe that technology could lead to more fulfilling lives. AI and robots seem to be everywhere, handling more and more work, freeing humans up — to do what? In this 3-part serie, contributor Jill Eisen explores the digital revolution happening in our working lives. Artificial intelligence is on the verge of replacing our own intelligence. It took decades to adjust to machines out-performing human and animal labour. What will happen when robots and algorithms surpass what our brains can do? Some say digital sweatshops—repetitive, dull, poorly paid and insecure jobs—are our destiny. Others believe that technology could lead to more fulfilling lives. **This episode is Part 1 of series. Part 2 airs Tuesday, July 31; Part 3 airs Tuesday, August 7. **This episode originally aired September 13, 2017. The digital age is transforming the way we work. Some would even say that artificial intelligence, robots, and automation are destroying it. 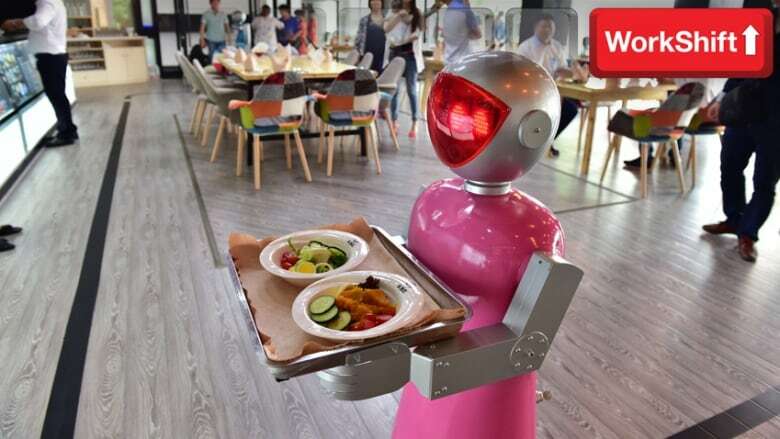 No one doubts that AI, along with machine learning, advanced robotics, 3-D printing and the internet of things will disrupt the labour market. It's just a question of how much. One influential study coming out of Oxford University estimated that 47 per cent of jobs in the U.S. could be eliminated using existing technologies. Everything from fast-food and retail jobs to legal and medical jobs are in the crosshairs. The big question is whether new, well-paying jobs will come along to replace the old ones. If recent trends are any indication, it doesn't look good. Since the mid-1990's contract, part-time and temporary work have accounted for 60 per cent of all new jobs across most developed countries, and in 2016 an astonishing 90 per cent of new jobs in Canada were part-time. If the benefits of the new technologies are to be broadly shared, there will have to be big changes ahead. Labour laws and employment standards will have to be rewritten, our social safety net will need strengthening, governments will have to take a more active role in directing the economy and unions will have to find new ways of representing workers. Martin Ford, Silicon Valley Entrepreneur and author of Rise Of the Robots: Technology and the Threat of a Jobless Future. Nick Srnicek, Lecturer at King's College in London, England. Author of Platform Capitalism and co-author of Inventing the Future. Robert McChesney, Professor in the Department of Communication at the University of Illinois, and co-author of People Get Ready: The Fight Against a Jobless Economy and a Citizenless Democracy. Ursula Huws, Professor of Labour and Globalization at the University of Hertfordshire in London, England and author of Labour in the Global Digital Economy. Guy Ryder, Director General of the International Labour Organization. Chris Roberts, Director of Social and Economic Policy at the Canadian Labour Congress. Sam Gindin, Former Research Director for the Canadian Auto Workers – now Unifor – and co-author of The Making of Global Capitalism. Guy Standing, Professor of Economics at the London School of Economics and author of A Precariat Charter and Basic Income: And How We Can Make it Happen. Sunil Johal, Research Director at University of Toronto's Mowat Centre and co-author of the reports, Working Without A Net and Policy Making for The Sharing Economy. Juliet Schor, Professor in the Sociology Department of Boston College and author of The Overworked American and True Wealth. Evelyn Forget, Health Economist at the University of Manitoba. There's a huge number of books published on this topic since 2015. Here are some of them that Jill Eisen found helpful. Rise of the Robots by Martin Ford, published by Basic Books, 2015. People Get Ready by Robert McChesney and John Nichols, published by Norton Books, 2016. Labour in the Global Digital Economy by Ursula Huws, published by Monthly Review Press, 2014. A Precariat Charter by Guy Standing, published by Bloomsbury, 2014. Basic Income: A Guide For The Open-Minded by Guy Standing, published by Yale University Press, 2017. True Wealth by Juliet Schor, published by Penguin Books, 2011. The Overworked American by Juliet Schor, published by Basic Books, 1993. Inventing The Future: Postcapitalism and a World Without Work by Nick Srnicek and Alex Williams, published by Verson Books, 2015. Platform Capitalism by Nick Srnicek, published by Verso, 2016. The Making of Global Capitalism by Sam Gindin and Leo Panitch, published by Verso, 2013. Utopia For Realists by Rutger Bregman, published by Little Brown, 2014. The Second Machine Age by Erik Brynjolfsson and Andrew McAfee, published by W.W. Norton &Company, 2016. Machine Platform Crowd by Erik Brynjolfsson and Andrew McAfee, published by W.W. Norton & Company, 2017. The End of Work by Jeremy Rifkin, published byTarcher, 1996. The Future We Want by Sarah Leonard & Bhaskar Sunkara, published by Metropolitan Books, 2016. Cyber-Proletariat by Nick Dyer-Witheford, published by Between The Lines, 2015. The Wealth of Humans by Ryan Avent, published by St. Martin's Press, 2016. What's Yours is Mine by Tom Slee, published by Between The Lines, 2016. Peers Inc by Robin Chase, published by Public Affairs, 2015. Economic Possibilities for Our Grandchildren by John Maynard Keynes, 1930. Policy Making for The Sharing Economy by Sunil Johal and Noah Zon, published by Mowat Centre, U of T, 2015. This is the opening session of the International Labour Organization's Conference: The Future of Work We Want. Lord Robert Skidelsky's talk starting about 14 minutes in is excellent. A talk by Robert McChesney, co-author of People Get Ready: The Fight Against a Jobless Economy and a Citizenless Democracy, Part 1. A talk by John Nichols, co-author of People Get Ready: The Fight Against A Jobless Economy and a Citizenless Democracy, Part 2. **This episode was produced by Jill Eisen and Greg Kelly.